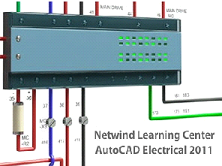 AutoCAD Electrical 2011 is a product used by electrical controls designers. Our multimedia training for AutoCAD Electrical is a comprehensive tutorial that takes you step-by-step through the essential functions of AutoCAD Electrical. The training program covers the comprehensive symbol libraries and tools for automating electrical engineering tasks, which is designed to help beginners and experienced users save hours of time and improve their proficiency. and customize libraries, reference files, and databases. This AutoCAD Electrical training program includes the exercise files used by the instructor, so you can open the files and learn as you practice the same exercises on your own. What are Wires and Ladders?